The Island of San Giorgio Maggiore with Venetian Gondolas in the foreground, in Venice, Italy. The Island of San Giorgio Maggiore in Venice, Italy is just across from the Piazza San Marco. Nowadays the island is considered a cultural centre - it boasts an ancient library, a theatre for musical and dance productions and recitals, a 16th century church and a Benedictine monastery. During Napoleon's time the Island of San Giorgio Maggiore was plundered and some of the treasures were damaged. Later the Austrians left sheds and huts all over the island. The Giorgio Cini Foundation now maintains the island and has restored and rebuilt the damaged artifacts. Pictures from photo gallery "Venice Pictures"
This picture is part of the photo album "Venice Pictures" - there are more beautiful images waiting for you. To buy a traditional wooden Gondola the Gondolier will have to spend at least 20,000 Euros - however, with care it should have a working life of about 20 years. The first record of Gondolas on the Grand Canal dates back to the 11th century, but today's style was developed in the 19th century. 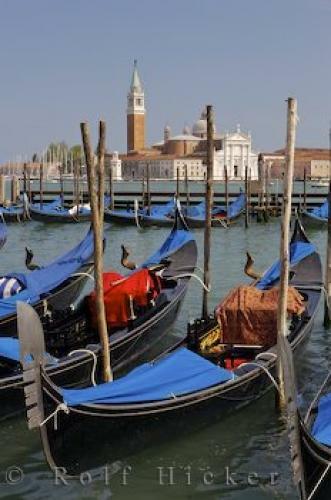 Gondolas on the Grand Canal opposite the Island of San Giorgio Maggiore in Venice, Veneto, Italy, Europe. I photographed this photo with the digital SLR camera model Canon EOS-1Ds Mark II, aperture of f/10.0, exposure time of 1/80 sec. on ISO 100, as always I used a original Canon Lens, the focus lenght for this picture was 58mm.